I recently saw someone post about small businesses and what they provide vs. large corporations. I don’t recall exactly but it inspired me to share this . . . When you support my small business, you aren’t supporting a CEO with buying his vacation home, you’re helping my family pay our rent. When you support my small business, you are helping my family pay for my daughter’s education. You are helping my family put food on our table. You are allowing me to share my passion and my mission one more day. You are allowing me to share the message of love and hope with young women at an abuse shelter. You are allowing me to serve young women all across the state and region. You are allowing me to continue writing, inspiring, serving, and supporting. You are the reason I get up everyday and focus on learning and growing so I can teach and serve. You are the reason I keep bringing this work and these words forward. It is because of YOU that I get to show up every single day. Thank you for supporting my small business. It is the most amazing blessing to me and my family. I hope this holiday season that you’ll choose to support small businesses that you love. You might not think your $10-50 (or more) purchase makes a difference, but it absolutely does – to any small business. 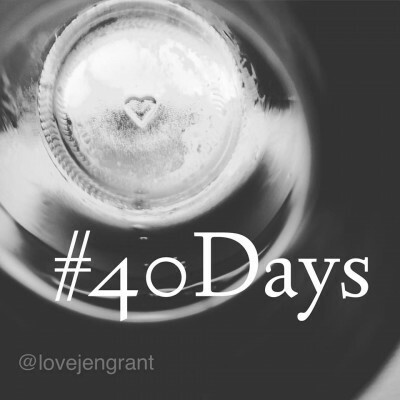 And of course, the opportunity that I am so pleased to be able to share with you – #40Days . . . While the details of the entire program next year are still unfolding, I do have some of them in place. There will be 8 full 40 day themes and in between the end of one and the start of another will be a 2-day weekend. (Each program will start on a Monday and end on a Friday, lasting for 40 days.) This schedule will leave approximately 3 weeks at the end of the year – we’ll call The Bonus Nine. Originally, I was going to have 9/40 day themes at $18 each for a total of $162 for the year. With this change though, the full year will only be $144. You can receive ALL of this for only $18/theme. However, if you decide to say YES between now and Cyber Monday (Nov 28-midnight Nov 30), you will receive the entire year for only $135! November 30th, you’ll receive ALL of 2016 for only $135. For each person that you refer (and they sign up) you’ll go into a drawing for a prize package worth $100. You receive a complimentary 30 minute skype or phone call with me, scheduled at your convenience any time throughout the year. Whatever you choose to do this day, I hope you’ll please consider supporting a small business that you love. Remember, when you do, you are literally helping them to stay in business another day, another month, another year. On behalf of small businesses everywhere I thank you. Truly. You are the reason we keep doing what we’re doing.